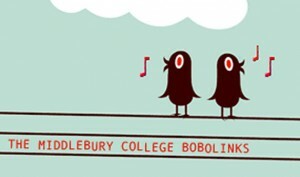 Middlebury College’s oldest coed a cappella group Bobolinks will perform Monday October 15 at 7 p.m. at Our Lady of Lebanon Cathedral, 113 Remsen Street (Henry Street entrance). The concert is free, with donations appreciated. Bobolinks’ repertoire ranges “from rock to hip-hop to bizarre British neo-pop & everything in between.” The group was selected to appear on the “Voices Only” CD compilation featuring the best college a cappella music of 2011. The group is now touring to raise money to produce its own all-Bobolinks CD. Student music director Catherine Charnov, a 2013 Middlebury graduate, is a Brooklyn Heights resident who graduated from St. Ann’s School in 2009. She also performed in the Brooklyn Youth Chorus Academy, where she trained for 11 years. We were disappointed @ Our Lady of Lebanon Cathedral not to see our announcement of the “Taste by the Bridge” for last Sunday (9/30) on the Blog. I sent it to you 3 weeks ago and looked forward to seeing our neighbors at the event. In spite of the omission the event was a success and we look forward to making it an annual event.